Winning promotion back to the third tier of English football last season meant that little bit more to a player dubbed by Town’s fans as ‘one of our own’. Defender James Justin has been with the club since he joined as a seven-year-old back in 2007 when Luton were last in League One. You know its been 10 years since we’ve been in League One and it’s just massive for the town and the club, so only good things can come of it. 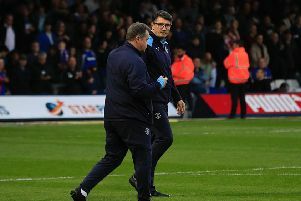 He has seen them drop down into non-league in that time after suffering various points deductions from the FA, so when asked if going up was a better feeling for the homegrown players, Justin said: “Yes, 100 per cent, it was only me and Frankie (Musonda) that were here during the hardship and when we were falling down the leagues, the FA and stuff like that. “But we’ve bounced back from it and we’re going back to where we should be. After failing in their attempts last year due to play-off agony against Blackpool, who reached the final with a last-gasp winner, Justin appreciates how big a feat winning promotion is to any player. He continued: “It was my first time, I missed out on it last year in the heartbreak, that kind of added to it. “It was just an amazing experience on the way back (from Carlisle) and everything that followed it. “It was just a party atmosphere (against Forest Green) from kick off really and I think we showed it during the match, afterwards, when we were parading around, all the fans were great. “The parade that followed it as well, I really enjoyed it. “The whole square was full up and on stage doing our thing was good. “Some people don’t even achieve it in their careers, and Harty (Paul Hart), even though he’s been at the top level most of the time, he’s still never had the feeling of promotion. On which games stuck out for the defender during the course of the campaign, Justin added: “From the ones that I was involved in personally, I think the Lincoln one (4-2 win), was probably the highlight of my season. “The ones I wasn’t involved in, Carlisle and Cambridge, that looked good watching on.